Fans of online slots though we are, we are not averse to diverting our attentions to some table games occasionally and Poker, Roulette and Blackjack are among our favourites. Blackjack Switch from Playtech is an interesting take on the genre and the game initially looks like a standard Blackjack table; it’s the ‘switch’ and ‘super match’ features which adds the extra dimension. Blackjack players will be familiar with the layout of the table; the dealer is at the far side of the table along with the chips and the cards while on the nearside are two circles where you can place your bets. The centre of the table contains the payouts and on what hand the dealer stands. 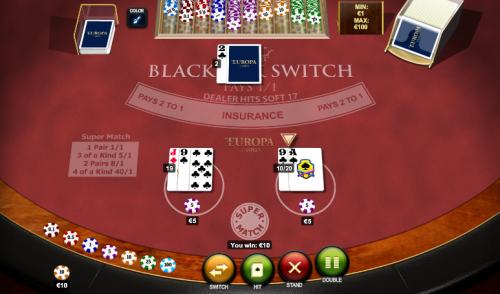 The first clue that this is slightly different Blackjack game are the two circles where you place your bets; this indicates that you can play two hands simultaneously and is also the basis for the ‘switch’ feature. So you bet in the normal way but note that the chip value you choose will be placed on both circles, doubling your pick. The cards can now be dealt, you’ll receive two hands face up and are given the usual options to Hit, Stand or Double but you’ll also notice the option to Switch. Switching gives you the chance to move the top card from each hand to the other one; this is handy of course if by switching you can create better hands. So you can do this if you wish and then complete the hand in the normal way. You don’t need to switch to create the combos either, the game will automatically spot matching cards of they are in different hands. Blackjack Switch adds some nice touches to the standard game to offer something a little bit extra for those who require such things. The gameplay is nice and simple and the chips are worth from £0.10 to £100.